My 100th U2 show (that’s in 25 years since the ZooTv tour in 1992) was also the last US show on the first leg of this 30th Anniversary Joshua Tree tour. It was significant to me that my 100th show was a Joshua Tree show since it is my favorite album and I missed the original Joshua Tree tour in 1987 because I was only 14 and my mom wouldn’t allow me to go to the concert. It was a great show, although it was the same set list as the previous show in New Jersey. I had a great time, and I was the closest I had been all tour. I left New Jersey Friday morning (after the two back to back shows at MetLife Stadium) around 8:45am. I stopped once and was in Cleveland parked at the DoubleTree Hotel by 4pm. To my surprise, I had a package waiting for me. My friend Sharon was so sweet sending me a bottle of champagne and chocolates in celebration of my 100th U2 show. I unpacked, rested for a bit, then took the hotel shuttle to the arena for a concert from a different group (more about that show on my DeenasDays blog). After the show, I walked back to the hotel and hung out with Sharon for a bit before going to sleep around 3am. Fives hours later, I was awake but stayed in bed watch tv until about 11:45am. Then I got ready and met Sharon in the lobby at 12:30 to take the hotel shuttle over to FirstEnergy Stadium. I got my number for the RedZone and hung out there under the tent for the rest of the day – conserving energy. I was number 16. I was in the RedZone thanks to Anna-Lisa and Alison for selling me their extra RedZone ticket. I hung out with Amy (whom I met at the Louisville show), Drew (my old friend from the Elevation tour) and Erin (whom I met on the ieTour). We all also stood together on the rail where the ramp meets the Tree stage. One Republic took the stage at 7:30 and played until 8:25. I do enjoy them – SO much more than The Lumineers. Ryan, the lead singer, jumped down and ran around the entire tree stage slapping everyone’s hands. They had the same set list as in Miami and Louisville, covering Louis Armstrong’s “What a Wonderful World” – Ryan says it is his favorite song ever written. They again ended their set with “If I Lose Myself,” which definitely my favorite of theirs as it ends with everyone playing drums – SO fun! U2 took the stage at 9:25 and played for two hours. I LOVED being that close to the ramp when Larry strutted out to start the show in his black tee and black pants! I could have literally reached out and touched the ramp. I held up my little 100th show sign, but Larry is very focused on his strut, so he did not see it. Bono began to thank The Lumineers for opening but then caught himself and said The Lumineers were replaced tonight by One Republic. I held up my sign a few times and I believe Edge and Adam each saw it. A few times Bono mentioned this was the last show in the US on this leg, but still nothing special in the setlist (same as Jersey2). 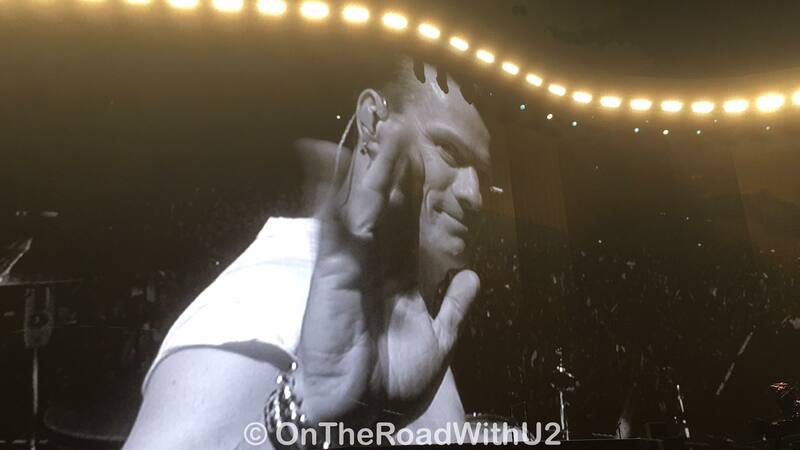 Edge and Adam’s security guys were dancing with each other during “Trip Through Your Wires.” And after “Trip Through Your Wires,” Bono gave shout outs to Sammy O’Sullivan (Larry’s drum tech), Joe O’Herlihy (Audio Director) and Willie Williams (Stage Designer). Edge’s security guy and Brian were laughing at Bono’s walk up the ramp after “Exit.” Surprisingly, the only time I teared up during this last US show of this leg and my 100th was at the end of the Joshua Tree set when Bono talked about how special The Joshua Tree was and is to them – as it is to me. For the encore, Larry changed into his white tee. During his “Elevation” cam, Larry gave a smile and a wave. (Larry blowing a kiss in Chicago2 is still my favorite – look for a compilation of Larry’s Elevation cam from me in the coming days.) After dancing with a female fan (Beth Whitten, who was fantastic!) 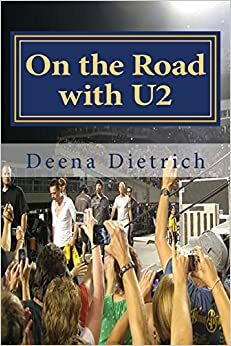 during “Mysterious Ways,” Bono says that his wife Ali is here and this is her second show (a female fan also danced with Bono during “Mysterious Ways” at the previous show in New Jersey) then to Ali he says that women aren’t always on stage – “just sayin.” Bono sang a “it’s only rock n roll” snippet in “Vertigo” again. After the show, we didn’t move – exhausted, but sad that it was over (at least for a few months). I noticed the set list was still there on the floor where Edge’s guitars used to be. Drew and I tried to get anyone’s attention, so I could have the set list to my 100th U2 show. Finally we got the attention of a young venue security and we (me, Erin and Drew) all plead my case. He gave me the set list and I shook his hand and thanked him as well as Drew and Erin for helping me. Then I saw an unopened bottle of water across from where the set list was and mentioned to Drew I would love to have that as well. Without me knowing, Drew hung around and got me that bottle of water and brought it over to me. What a guy! I finally made it out of the stadium and back to the hotel (big pedestrian traffic jam). Sharon and I stayed up until about 3am talking about the night’s events as well as the tour in general. I didn’t fall asleep until about 5am then woke up at 9:30am to drive home. I got home at 3:30pm exhausted. I had driven 1,038 miles since Wednesday seeing four concerts in four days. I am still exhausted today, but want to do it all over again. It is not only the concerts that are addictive, it is the traveling too. At least I get to do it all again in September when I go to the first and last US shows of the third leg in Detroit and San Diego. Please click here for all my photos from U2 The Joshua Tree 2017 in Cleveland. Wow! What a great U2 fan you are. My wife and I were in Cleveland, Epic! The boys can still rock. We are going to Detroit section 103 first row. Your an inspiration. We will be looking for you. Thank you! I’ll be in GA for Detroit. See you in September!